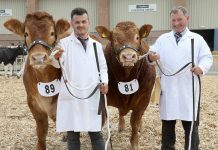 The British Limousin Cattle Society (BLCS) is returning almost £100,000 to its members in two breed improvement incentives. 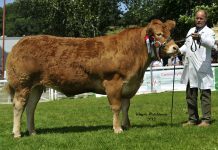 This comprises of just over £60,000 in the breed improvement refund incentive, and over £37,000 in a herd health initiative. £37,032 is also being refunded to members through its Herd Health Initiative. 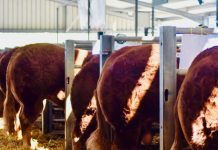 The cash-back scheme, based on £4+VAT for each calf registered in the past year, financially supports breeders who are making the long-term investment into herd health assurance through being a member of a CHeCS-approved health scheme. 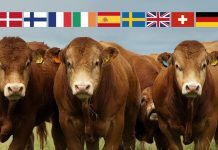 To receive the financial support, herds need to adhere to the terms of a CHeCS licenced scheme and have an approved animal health scheme in place through Cattle Health Certification Standards (CHeCS), the self-regulatory body for cattle health schemes in the UK & Ireland. This must include a whole herd test for Johne’s disease. In 2012, 328 herds made a claim on behalf of 9,258 calves registered in the year – up by 6% – meaning 47% of all pedigree Limousin calves are now born within herd health schemes. The Society began its health initiatve refunds in 2005 and has, to date, refunded over £140,000 back to members. 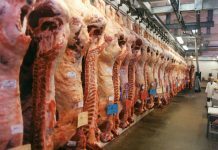 Over the intervening years, uptake in health scheme membership has increased markedly with momentum further driven by the health rules regarding Johne’s and BVD which were introduced at Premier BLCS Collective Sales from 1st May 2011.